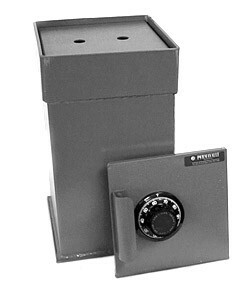 Perma-Vault Safe’s commercial in-ground floor safe provides convenient and out of sight security. Includes cover plate for inconspicuous cover. Place a floor mat or carpet over top and no one will know it’s there. Commercial In-Ground Floor Safe is made in the U.S.A.
PV-IG12 Equipped with UL approved Group II combination lock. Lift off door. Cover plate included. 9 1/2″ x 9 1/2″ x 13 1/4″ 50 lbs. PV-IG16 Equipped with UL approved Group II combination lock. Lift off door. Cover plate included. 9 1/2″ x 9 1/2″ x 16 1/4″ 61 lbs. The instant you store your belongings into the Commercial In-Ground Floor Safe, Perma-Vault Safe is on guard, protecting you against robbery and theft. Its ability to be hidden out of sight increases the in-floor safe’s effectiveness.